Of all the people in Asia, nearly 3 billion and counting, none approach technology in quite the same way as the 128 million of them who inhabit the island of Japan. The Japanese may not be the originators or inventors of the technology that they zero in on, but they are without peer at acquiring technology and then making it far superior than the original invention. The most notable example is the automobile assembly line, introduced to Japan in the 1950s as a way for the U.S. to manufacture military equipment for the Korean War. In the hands of Kiichiro Toyoda in 1956, the imported technology underwent a dramatic improvement when Toyoda introduced lean manufacturing, just-in-time (JIT) manufacturing, and kaizen. The same is true for electronic computers. The Japanese historian Yoneyuki Sugita, Pitfall or Panacea: Japan 1945-1956, shows the very same scenario playing out in 1955 when an unknown Tokyo company named Tsushin Kogyo took a chance and bought Bell Lab’s patent for a strange machine called a transistorized computer. Bell Labs had built the world’s first. Two years later Tsushin Kogyo rolled out the world’s second transistorized computer, the ETL Mark 3. Shortly thereafter, the company changed its name to SONY. 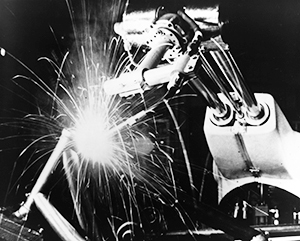 By 1967, tech-savvy Japan was ready to hear from Joe Engelberger, the “father of robotics,” about his world’s-first industrial robot, the Unimate, and about the company that built them, Unimation. Engelberger spoke to a massive crowd of engineers and endured a five-hour Q&A session immediately following the lecture. Kawasaki Heavy Industries quickly licensed the technology to manufacture and sell Kawasaki-built Unimate robots for the Asian market, especially their own. Two years later, Kawasaki sold its first Unimate and by 1983 had produced 250,000 more, which at the time represented half the world’s supply. Nearly fifty years on, Japan has become the center of the universe for robot production, with more robot companies producing and deploying more robots than any country in the world. Manufacturers like Denso, Epson, FANUC, Honda, Hitachi, Kawasaki Heavy Industries, Mitsubishi Electric, Nachi Fujikoshi, Nissan, Panasonic, SONY, Toshiba, Toyota, Yamaha Motor Company, and Yaskawa Electric have captured nearly fifty percent of world production. 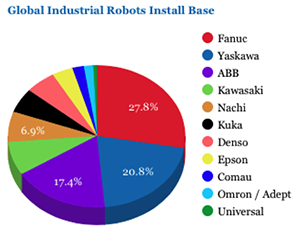 Japan’s Ministry of Economy, Trade and Industry (METI), reported inJapan’s Robot Strategy that in addition to the country’s annual $6.9 billion in industrial robot sales, Japan enjoys a 90 percent market share in key robotics parts such as precision reduction gears, servo motors, and specialized sensor technology. Japan also has an unrivaled advantage when it comes to intellectual property (IP) for industrial robotic technologies, an edge that will keep it far ahead of its Asian and world competition for years to come. Since the days of Joe Engelberger’s marathon five-hour Q&A in Tokyo, Japan has very successfully branched out from the more traditional industrial robotics technologies and into those of medical-assistive robotics (exoskeletons), humanoid, marine, and autonomous automobiles and trucks. However, with all of its prowess in building and deploying industrial robotics so dominant, Japan also shows some major lapses in robot preparedness and lack of foresight. For a country that sits directly on one of the world’s greatest and most dangerous earthquake farms, Japan has never exhibited any propensity for building disaster or rescue robots. Other overlooked areas needing re-examination are in mobile robotics for logistics as in automated guided vehicles AGVs/UGVs unmanned ground vehicles; surgical robotics; and also with collaborative or cobots (capable of working in close proximity with humans). Forecasts for a steady downturn in robot and automation sales suddenly reverse—with good reason! Will Toyota Industries Take Bastian to Tokyo? 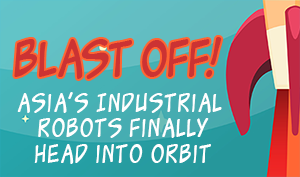 After 12 Years, AIBO’s Out of SONY’s Doghouse! What next? Is it too late to recapture the magic that made this robot dog loved by so many?